The following announcement from Owen Williams at the Folger Shakespeare Library may be of interest to readers. The Folger Shakespeare Library, located on Capitol Hill in Washington, D.C., is seeking an encoding specialist for a 2 year NEH grant funded position working on our Digital Anthology of non-Shakespearean drama (or early modern English drama). The Folger is a world-class research and cultural center on Shakespeare and the early modern age. Home to the world’s largest and finest collection of Shakespeare materials, the Folger offers activities that range from scholarly seminars to theatrical performances, from K-12 outreach to exhibitions and lectures. The Digital Anthology Encoding Specialist (DAES) will work closely with our CLIR Postdoctoral Fellow in Data Curation on a new project to establish clear and consistent encoding of 36 carefully selected plays from the early modern period using Text Encoding Initiative (TEI) markup. The DAES will be responsible for helping develop the XML schema, correcting current markup, and enhancing existing encoding work to correctly identify and verify such elements as act and scene divisions, speakers and speech prefixes, cast lists, stage directions, or other information. They will help establish standards and workflows for coding correction, participate in project documentation, and identify areas for further improvement as the project develops. This is an exciting opportunity to be in on the start of a project that will open the study of these, and other, plays to a wider audience on open and free platforms. This is a grant funded position at no more than 50K a year plus full benefits. The ideal candidate for this position will have a working knowledge of early modern drama, including the works of Christopher Marlowe, John Marston, and others, as well as significant training or experience in TEI markup language. Requirements: B.A. in relevant field with a preference for M.A. 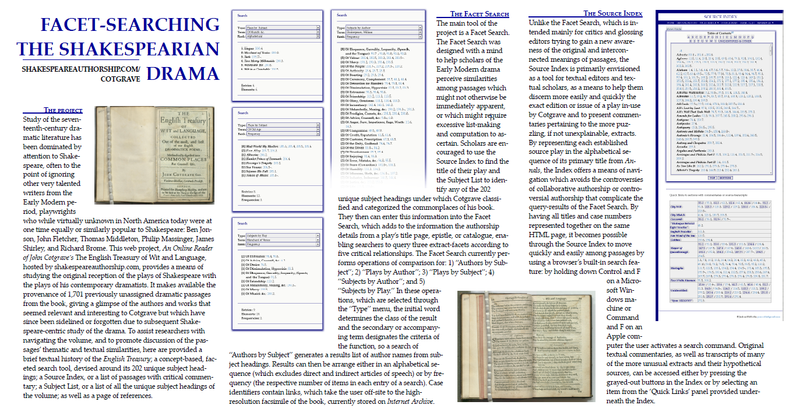 in early modern English drama, history of early modern theatre, or literature, or equivalent professional experience, strong knowledge of Early Modern Drama, experience with TEI markup, and familiarity with the concepts behind Early English Books Online-Text Creation Partnership (EEBO-TCP). Preference will be given to candidates familiar with early modern descriptive bibliography, text mining, topic modeling, digital indexing, and/or digital publication. Interested applicants should submit their resume and a cover letter, with the subject line ‘DAES’ to jobs@folger.edu or by mail at Attn:HR/DAES, Folger Shakespeare Library, 201 E Capitol St SE, Washington, DC 20003. Incomplete applications will not be considered. No phone calls please. EOE. This month has already seen a number of news items of potential interest to EMOB readers including Gale-Cengage’s announcement that will it offer STEM e-books from Springer and Elsevier (a potentially potent nexus of publishing forces in the subscription database world) as part of its Gale Virtual Reference Library (GVRL) and that it is launching a Proprietary Monograph Publishing Program; free access in March to Orlando: Women’s Writing Online that Anna announced here a few days ago; and a note from Dr. Ian Christie-Miller about digital imaging resources he has been developing and the interest it has received in the UK. Just this week the Folger announced that all 38 of its digital texts of Shakespeare’s plays are now available, free of charge, online. As the homepage’s title Timeless Texts, Cutting-Edge Code suggests, a key feature of these texts is the robust coding that one can freely download. Besides the meticulously executed TEI-compliant XML structure of these plays, the texts are also attractively designed for reading as this opening of All’s Well That Ends Well illustrates. This page also displays the useful digital paratexts accompanying each work. Barbara Mowat and Paul Werstine offer a brief Textual Introduction to the site. We would like to hear from others about how they are using this new resource–both in terms of its texts and the source code. On 17 September 2013, St. Peter’s College Oxford will host a one-day conference, “A Miscellany of Miscellanies: Popular Poetic Collections and the Eighteenth Century Canon” and an evening performance of eighteenth-century music to launch the Digital Miscellanies Index. This Leverhulme-funded index was three years in the making. Its publication will make freely available 1,000 poetic miscellanies published during the eighteenth century. The Index adds to the porjects hosted by Bodleian’s Centre for the Study of the Book. The Bodleian Library’s Harding Collection, “which houses the most significant but largely neglected group of miscellanies in the world,” contains the majority of the miscellanies, but the project also contains data about copies held at the British Library and the Cambridge Library. The project developers based their work on Professor Michael Suarez, S.J.’s recent bibliography of eighteenth-century poetic miscellanies. We look forward to the availability of the Digital Miscellanies Index and to hearing the experiences of EMOB readers using this new resource. This is the second of a two-part series on free digital archives featuring English ballads. It follows Eleanor’s discussion of the JISC-funded Broadside Ballad Initiative at Oxford. The University of California at Santa Barbara has created a free digital ballad collection called The English Broadside Ballad Archive (EBBA), which provides access to more than 8,000 seventeenth-century ballads. The collection includes ballads from the Pepys Collection, the Roxburgh Collection, the Euing Collection, and the Huntington Library. EBBA is directed by Patricia Fumerton at UCSB. This project was supported by the N.E.H. Individual entries provide links to sheet facsimiles, facsimile transcriptions, and often recordings. These features facilitate introducing students both to ballads’ visual details–ornaments, woodcuts, columned verse–and to their tunes. EBBA ID: An internal identifier. Each individual ballad in the archive has a unique EBBA ID. Title: A diplomatic transcription of the ballad title as it appears on the ballad sheet. The title consists of all ballad text before the first lines of the ballad, including verse headers but excluding text recorded elsewhere under other catalogue headings (such as the license or author, date, publisher and printer imprints). Date Published: The year—or, in most cases, range of years—during which EBBA believes the ballad to have been published. See Dates. Author: The recognized author of the ballad in cases where an indication of authorship has been printed on the ballad or, in the case of Pepys ballads, when Weinstein has identified an author from external sources (e.g., Wing, Rollins). Standard Tune: The standardized name for the melody (according to Claude M. Simpson or other reliable sources). Clicking the standard tune name will return all ballads with the same melody, including alternate tune titles. Imprint: A diplomatic transcription of the printing, publishing, and/or location information as it appears on the ballad sheet. License: A diplomatic transcription of the licensing or permission information as printed on the ballad. Sheet/Page: For ballads that are collected as independent sheets, the citation page displays the word “Sheet” and lists the sheet number given to it by its holding institution (usually part of its shelfmark). For ballads bound in a book, the citation page displays the word “Page” and lists the page number within the bound volume. Location: The name of the holding institution. Shelfmark: The shelfmark assigned by the holding institution. ESTC ID: The Citation Number for the English Short Title Catalogue (ESTC). Use this number to find the full ESTC citation for any given ballad at http://estc.bl.uk/. Keyword Categories: The keywords from EBBA’s standardized keyword list that relate to the ballad’s theme and content. Notes: Clarify potential areas of confusion for users, such as ballads that have print on both sides of a sheet. Additional Information: Information specific to each part of the ballad. Title: Separate titles for multi-part ballads. Tune Imprint: Tune title(s) as printed. First Lines: A diplomatic transcription of the first two lines of the ballad text proper, below any heading information included in the title or elsewhere under other catalogue headings. Refrain: Repeated lines at the end of or within ballad stanzas. Ballad scholars working with EEBO or ECCO will be familiar with the difficulty of finding ballads, making English Broadside Ballad Archive and Bodleian Library Broadside Ballads necessary. Together with new printed resources, such as Patricia Fumerton and Anita Guerrini’s Ballads and Broadsides in Britain, 1500-1800 (Ashgate 2010) and Angela McShane’s Political Broadside Ballads of Seventeenth-Century England: A Critical Bibliography (Pickering & Chatto 2011), these digital resources provide a robust and growing archive for the systematic study of a format whose transiency may have discouraged such studies in the past.